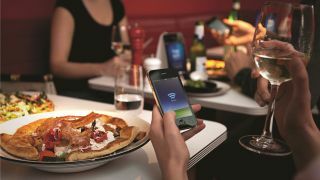 Sky will launch its Wi-Fi hotspots from The Cloud initiative in mid-April with a nifty app that will allow its customers to automatically connect to any of more than 10,000 hotspots. Since purchasing The Cloud in February 2011, Sky has been relatively quiet on its plans for the Wi-Fi network, but has now announced just how it will become part of customers' packages. For those on Sky Broadband Unlimited, Sky Connect or the forthcoming Sky Fibre Unlimited, access will be free and unlimited. But perhaps the best part of the arrival is the app, which will only require an initial sign in from the customer on one of six devices before allowing the device to automatically connect to the hotspots. It's an elegant solution to the age-old Wi-Fi frustration of having to enter details to get on. Partners for The Cloud include Caffe Nero, Eat, Pret A Manger, JD Wetherspoons, Pizza Express and Ted Baker along with newly announced deals with Network Rail and Kings Cross. "Whether it's to go on Facebook, watch favourite TV shows with Sky Go, catch up on the news or send an email, our customers can now enjoy high quality, reliable and unlimited broadband whether it's at home or when out and about," said Lyssa McGowan, Director of Communication Products at Sky. "Wi-Fi Hotspots from The Cloud now gives millions of Sky customers quick and easy one-touch access whenever they want to be online. "And by ensuring our hotspots are located where our customers need them most, they know they'll never be far from a high speed connection. "With a one-off registration process, they'll automatically connect to the network, which takes all the usual hassle out of connecting to Wi-Fi." The app will be available for Android or iOS, but not Windows Phone 7 or BB OS at launch, although Sky are working on these operating systems. You will also be able to log in thorugh the normal Cloud portal if the app is not available for your device.